One of the things I did a lot of this past year is foraging. Some call this wildcrafting. It's simply looking for and harvesting wild growing food or medicinal plants. Foraging sounds difficult but it's really easy and these 8 wild herbs I foraged for are really easy to identify if you know what you're looking for. To start foraging, I took a lot of foraging walks. I live far out in the country and take walks down these lovely country roads and wooded trails several times a week. I found some wonderful things like a field full of Milkweed, and one certain path that has tons of Red Clover growing. 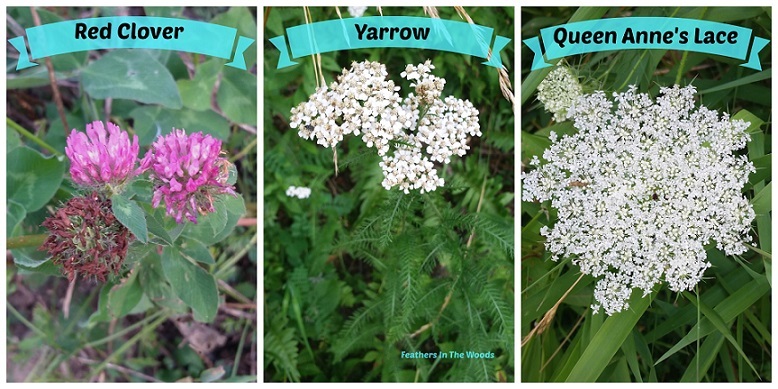 There's a huge patch of Jewelweed around the corner and up the road and Yarrow grows at the end of my driveway. Red Clover: I collect just the flower tops of the Red Clover plant. I dry these and use them in tea. A tea made with Red Clover is said to help with menopause symptoms and other women's issues like PMS. It's also considered a blood purifier among it's many other uses. Here's How I Dry And Use Red Clover. Yarrow: I collect the flower heads and leaves of the Yarrow plant to use for relieving fevers, sore throat and shortening the duration of the common cold. It can also be used topically for healing wounds. While there are several plants that look alike, it can be identified by its flowers which grow in an asymmetrical clump and it's fine fern like leaves which grow in pairs on opposite sides of the stem. Queen Anne's Lace: Also known as wild carrot, the root is often used for kidney stones which both my husband and my stepson managed to get a few years ago. This is what led me to Queen Anne's Lace and I preserve all parts of the plant including the seeds as they all have different uses. The flowers of the Queen Anne's Lace grows in a circular mass and sometimes has a reddish purple dot right in the center of the flower head. This plants leaves look a lot like thin carrot leaves and just sort of grow wherever they want from the stem. Queen Anne's Lace has small hairs all along the stem. Do not use if pregnant. Warning: Yarrow and Queen Anne's Lace can be confused with a few other plants including Poison Hemlock and Hogweed. If you aren't positive which plant you've found though, please don't touch it. It could turn out really bad! Mullein: With it's long, super soft leaves and towering spike of bright yellow flowers this is one you won't confuse. It probably has other uses but I only harvest the flowers to make an oil which is amazing for earaches and infections. This oil can also be rubbed inside your pets ears to treat ear mite infections. Jewelweed: These delicate orange flowered plants with their exploding seed pods have always been my favorite. Especially as a kid when I loved touching the fattest of the seed pods just to watch them explode! Now though, I harvest all the green parts of the plant to use in soaps and lotions which are extremely helpful against the itch of Poison Ivy. Nature often puts the cure right by the problem and this is no exception. Be very careful when picking Jewelweed as Poison Ivy often grows in the same area! Plantain: I've been Harvesting & Drying Plantain for years! Broad leaf Plantain can be used as a tea or in salves. Externally, it has excellent anti-itch properties and can help heal a bug bite, cut or scrape. I make it into a salve and it really works wonders. It's a lot like a homemade Neosporin. It can also be prepared like a tea and used to treat digestive disorders and bladder problems. Dandelion: Just like everyone else, I do have Dandelion growing in my yard. However, I also have 60 or so chickens running around in that yard so I prefer to collect my Dandelion from a field deep in the woods where there's a better chance that it hasn't been pooped on by poultry! It also has a chance to grow much larger since my mower can't reach back there. The larger the plant, the larger the root. While I have used the dandelion flowers to make Dandelion oil and have eaten the young leaves in salads, the real winner here is the root. It can be dried or roasted and made into a tea to help with stomach discomfort and bloating. Dandelion root is often used to treat liver problems and detoxify the body. I really enjoy collecting wild herbs and making my own herbal preparations. I don't live in a busy area so there isn't much pollution but if you do live closer to the city do not collect herbs beside well traveled roads. They might have residue on them from car exhaust and other pollutants. Also, if you think the area you're in might have been sprayed with chemicals then just avoid collecting there. If the plants look withered, tattered or diseased then keep looking. You wouldn't want to bring home a crop of bugs or use a diseased plant in a tea. Only chose the healthiest looking plants and remember to leave enough so the crop will continue to grow. If you have any questions about plant identification at all consult a field guide or a reputable website. If you're still not sure, just skip it...it's always better to be safe then sorry when foraging. I will catch up reading your blog soon. I have a recurring rash my doctors can't clear up. In two weeks I am going to see a holistic healer and I am sure he will recommend herbs and other natural ingredients. I just love this idea of foraging for wild herbs! ....and they're free! PS - Please check your email - I just sent you one. I love the idea of posting about what you foraged for. Unfortunately I haven't done much of it. I haven't found a good spot to do so, and I'd be scared to pick the wrong thing! I'm glad that you like the post, and thank you for telling me about the hop! I'll add it to my weekly rotation....I'm always looking for more 'green' style hops to visit. Heading over there now! I really wish I had someone like you next door, or close by, because I would love to forage but am terrified of mis-identification. Thanks for the pictures, those help! Thanks for sharing on the Homestead Blog Hop! I forage for herbs where I live, too. Like others, I'm only familiar with the plants my dad taught me about, so I am afraid to try things I'm not absolutely sure of. I wish there were more hands-on plant identification classes near by. It's a little limiting to have to rely mostly on herbs you grow yourself or purchase, when there are so many wild plants! Sorry! Your message got stuck in my moderation file.....no idea why! Jewwelweed is Impatiens capensis. It's a great remedy for poison ivy and around here it's often growing right beside poison ivy. That makes it very tricky to harvest! Hope that helps!